The Scripture says to give honor to whom honor is due and so I need to say that this sermon was inspired by a talk from an Orthodox nun named, Sister Vassa. In her talk she linked the Eucharist to our celebration of Thanksgiving in America and I want to use her idea and offer my own thoughts on the subject. So if you hate this sermon it’s the nuns’ fault. The reason that she linked the Eucharist to this holiday is because as you know, Eucharist means to give thanks. President George Washington said at the beginning of his proclamation, “WHEREAS it is the duty of all nations to acknowledge the providence of Almighty God, to obey His will, to be grateful for His benefits, and humbly to implore His protection and favor; and whereas both Houses of Congress have, by their joint committee, requested me to recommend to the people of the United States a day of public thanksgiving and prayer, to be observed by acknowledging with grateful hearts the many and signal favors of Almighty God…” Of course the miracle here is that both Houses of Congress could agree on anything much less calling us to a day of prayer and thanksgiving and so we continue in that spirit today. While God is honored in such a holiday we must also know that thanksgiving should be more than one day. It should be a way of life for us as Christians. The makeup of the Eucharist as thanksgiving instructs us how to be a thankful people. The Eucharist or Holy Communion has three major components to it. They are “remembering” “thanksgiving” and “offering” and when we take these ideas beyond the Mass and into our daily lives then we become the thankful people that God has made us to be. Let’s look at each component. Remembering. Rite Two of the Holy Eucharist does this quite well. “We give thanks to you, O God, for the goodness and love which you have made known to us in creation; in the calling of Israel to be your people; in your Word spoken through the prophets; and above all in the Word spoken through the prophets.” Remembering is in the Jewish roots of Christianity. Every year they would retell the story of the Exodus in their Passover celebrations taking great care that each successive generation would know who they are and from whence they came and above all to know the faithfulness of God to His people. Many times the Prophets called on the people not to forget but to remember. In spite of all of our nation’s problems, we should be able to look back over our history and see the faithfulness of God and as President Washington said, acknowledge the providence of Almighty God. But I fear that awareness is being lost in our day. I grew up being taught about God’s hand guiding our nation but when my son was in grammar school I attended his thanksgiving play and there was not one mention of God or even of the religious motivations of the first pilgrims. Our history was revised to make it simply a celebration between Europeans and Native Americans but it was vastly more than that. That experience with my son was over 20 years ago. I don’t imagine it has improved. And lets be honest. 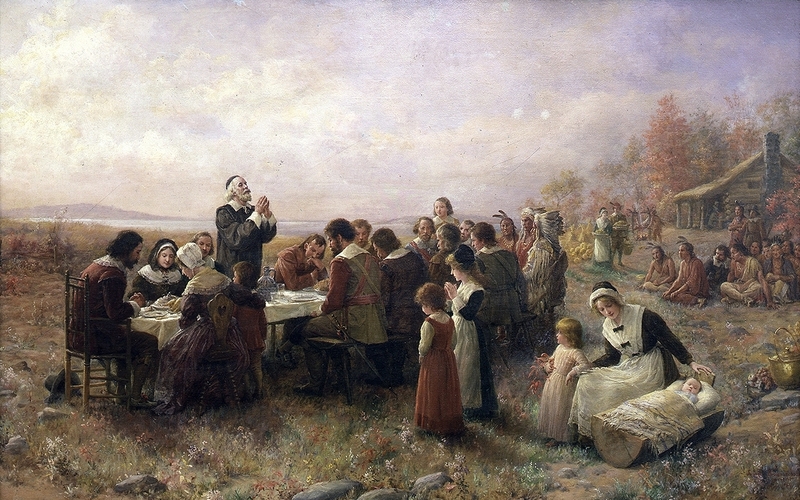 The true story of the first Thanksgiving does not put Anglicans in a good light. They came here to get away from us. They came here pursuing religious freedom from the Anglican Church and England where Church and State were one (but we’re baaaaaack!). Steeped in the Scriptures, and drawing their images heavily from the Old Testament, the first pilgrims made a covenant. They saw themselves as a new Israel coming to a new Promised Land, but they discovered it was not a land flowing with milk and honey, at least not at first. In the first year about a half of them died. Those who survived and began to flourish gathered to give thanks to God for His mercies. Remembering. Beyond looking at our corporate history and being thankful, what about your personal history? Are you thankful there too? All of us have hurts and failures from our past but if we can look with eyes of faith we will see the goodness of God all around. Even the scars that you would not wish on your worst enemy have been woven by God into the tapestry of your life and you are who you are today because of them. The poem called Footsteps became so popular because most people can look back on their lives and know that there were times that they were being carried by God. So when we remember we can see God’s faithfulness and this fills us with gratitude and wonder. Filled with gratitude and wonder then we move to actually giving thanks. In the Mass we are told that the first thing that Jesus did after He took the bread and after He took that cup, was to do what? To give thanks. But if truth be told most of us don’t do this enough. We are like the 10 lepers that Jesus healed but only one came back to give thanks. What is interesting in that story is that the Greek uses different words for what happened to those lepers. It says that the nine who went on their way were healed but the one who came back to give thanks was made whole. You don’t have to dig too deeply to know that there is a vast difference between the two. We are around people all day that are well but are not necessarily whole but by the grace of God we are seeking the latter. We are seeking to be made whole and giving thanks is a means of getting us there. Look with me at I Thessalonians 5 beginning at verse 16. “Rejoice always; pray without ceasing; in everything give thanks; for this is God’s will for you in Christ Jesus.” I would like to say a couple things about this passage. First there is a difference between giving thanks FOR everything and giving thanks IN everything. Let me give you a silly illustration. I’m sure that in the great scheme of things there is a reason for roaches but I don’t know what that is and so I find it difficult to give thanks FOR roaches. But if you have roaches in your house then it also means that you have food in your house. And since that is more than many folks around the world can say, then you can give thanks to God in the midst of your roaches. Okay again, that is silly but you won’t forget the difference, will you? Giving thanks IN all things is why the Apostles could write such uplifting words while they were in prison. Second, notice the weight the Apostle puts behind his call for us to give thanks in all things. He says this is God’s will for us in Christ Jesus. Giving thanks is not some good idea that a preacher dreamed up to make church more pleasant. Nor was it something that Dale Carnegie made up to make us more successful. Giving thanks is actually God’s will. Also you will notice that it is put in the imperative, which means it is a commandment. Giving thanks in all things is powerful medicine for the soul. If you are a glass half empty type of person, giving thanks will change that. If you are down about your current circumstances, giving thanks will change that. If you find yourself comparing yourself to others and always coming up short, guess what? Yep. Giving thanks will change that. I don’t mean that it will change your personality or put you aboard the Good Ship Lollipop. But what it will do is open the door for the fruits of the Spirit to replace the negativity, anger and hopelessness that are the hallmarks of this world. While it may not have been actually lived out in any culture, there is a notion in many cultures that if someone saves your life then you are indebted to them forever. That is certainly how the Apostle Paul saw it. While he held the office and title of Apostle, what did he most often call himself? Bondservant. He used that title because Christ had both saved and purchased him and as a consequence St. Paul did not see himself any longer as owning his own life. 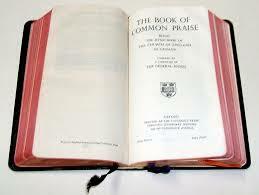 As Anglicans we have the rich heritage of the Book of Common Prayer to guide us in being a thankful people. I want to end by praying one most beautiful prayers ever written to expresses our gratitude. Please join me. Let us pray. Deitrich Bonhoeffer called what we did in the Campus ministry, “cheap grace.” Cheap grace says all you have to do is to sign up to enter the race. You may even buy some new running shoes, get a number and line up with the rest of them but that is all that you have to do. And yet it seems from this Gospel that Jesus is saying that you have to not only have to enter the race, but that you have to run it and finish to get the prize. This idea of finishing the race shows up in other places in the New Testament. James 1:12, “Blessed is the man who perseveres under trial, because when he has stood the test, he will receive the crown of life that God has promised to those who love him …” Turn to Revelation to John 2:10 and see these words given to the Church at Smyrna “Be faithful, even to the point of death, and I will give you the crown of life.” In fact the idea of being a faithful witness to the end is the major theme of the Revelation to John. Matthew 24 is a parallel passage to our passage today and in Matthew Jesus says, “But the one who endures to the end will be saved.” Now I certainly don’t want to imply that Jesus is teaching that we are saved by our works or by our own efforts. St. Paul is quite clear that we are saved by grace through faith. I believe that the Gospel before us is not about faith verses works; rather it is about faithfulness verses unfaithfulness. Let me offer this analogy. The easiest part of a marriage is the day you make your vows to one another. The real test is being faithful to those vows year in and year out until you are parted by death. If you think that all you have to do is to make a vow and then you can coast from there, your marriage probably won’t survive. You have to work at it every day to die to self and to live for that other person. And so it is with following Christ. If you think that all you have to do is get baptized or pray a sinners prayer and then you can coast from there, your faith probably won’t make it. You have to work at it every day to die to self and to live for Christ. You have to be faithful to your vow to Him until you are united by death. This Gospel begins by Jesus giving a prophecy about the destruction of the temple. Jesus says not one stone will be left upon another. Jesus’ prophecy happened as He predicted. In fact ancient historians tell us that the Romans not only burned the Temple and knocked down its walls but they even dug up the foundations so that it could not be rebuilt. Jesus goes on to warn of other horrible things like wars and famine and pestilence and terrors and great signs from heaven. Not surprisingly scholars are divided in how these words are to be interpreted. Some say these words were also fulfilled and some take these words to be predictions about the future or what is called the end of days. I frankly don’t think it matters which way you interpret these words because the application of this teaching remains the same. 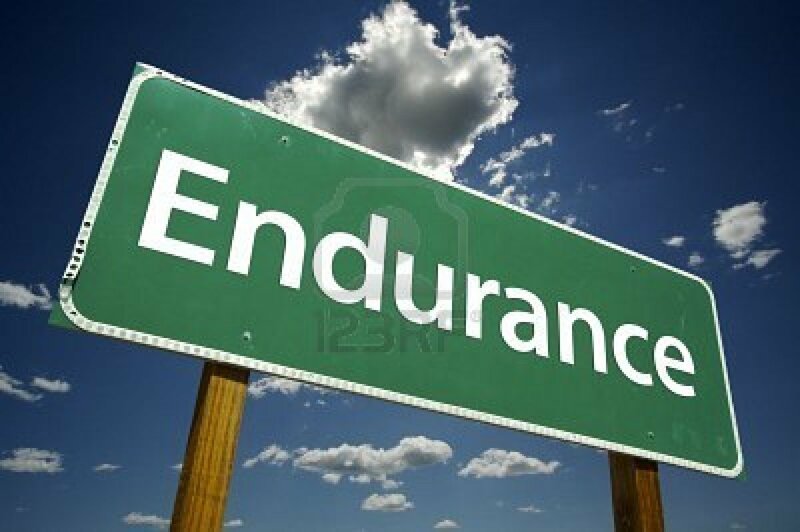 If it is about learning a lesson from the past or preparing for the future, the call to endurance is the same. In the midst of chaos, about which they could to nothing, Jesus warns the Church of two great dangers that do fall within their control. The first is deception and the second is their response to persecution. In Matthew’s version of this Gospel Jesus says that because of deception and persecution the hearts of many will grow cold, which it to say that many will stop loving and following Him. That is happening all around us. Just this week I read a very sad blog of a young woman who has gone from being a serious follower of Jesus to now declaring herself as an atheist. Most of the comments were how brave she was to come out of the closet and to admit it. I did not share their admiration because it broke my heart. It also reminded me that none of us are impervious to having our hearts grow cold. So how do we be a people who will endure to the end? Jesus said, “Take heed that you are not led astray; for many will come in my name saying, ‘I am he!” and “The time is at hand!” Do not go after them.” Beyond insane men like David Koresh or Jim Jones, who actually claimed to be the Christ, we have more subtle versions of what Jesus was warning about in our day. Just turn on your TV and you will find no shortage of guys who may not claim to be Jesus but certainly claim to be the next best thing and will unashamedly claim to be his mouthpiece. Years ago my parents were attending one of these guy’s churches in Orlando and when I went down for a visit I went to church with them. The preacher got up and said that he had not prepared a sermon but that we were going to get it through him directly from God. To top it off he said that he was going to preach on the Trinity, which is a topic that makes me tremble no matter how much time I have to study. I thought to myself, “This is going to be rich.” And it certainly was, rich with heresy. Thousand are being led astray by these kinds of false prophets. I have literally heard them say that God is powerless to act on the earth until we give Him permission to do so. Do really want that kind of power? Another very famous preacher said that Jesus never claimed to be the Messiah. I wondered what version of the Bible he was reading. Of course we in the Anglican Communion have had our share of false prophets. The Anglican Church in North America was birthed because of false prophets who claimed that God was doing a new thing. So we are not exempt from this threat. The question then is how we steel ourselves so that we are not led astray by those who claim to come in Jesus’ Name but in actuality do not. Our collect today points us in the right direction. It is by reading, marking, learning and inwardly digesting the Holy Scriptures that we are better prepared to avoid deception. I read that Federal Agents are trained to pick out counterfeit bills by becoming so well acquainted with the real thing that the fake ones become obvious. When we have spent considerable time with the true apostles and prophets contained in the Holy Scriptures then the counterfeit apostles and prophets will be easy to pick out. I love the group of people in the Book of Acts, called the Bereans. They received the Apostles’ teaching with joy, which meant that they were teachable. But then the text says that they went home and searched the Scriptures to see if the things that the Apostles were saying were so. Teachable but not gullible. But here is the rub. It takes work to read, mark, learn and inwardly digest the Scriptures. It is not something that comes to us automatically. You must be in a disciplined study of God’s Word if you truly expect to get anything out of it. I have spent my adult life studying God’s Word and it seems like I am still learning something new every week. God’s Word is living and active and so it stays current with us on our journey. An Anglican Bishop in the 19th Century named J C Ryle was famous for his intense study of Scripture. His publisher said of him that he was a one-book man, so steeped in Scripture that if you cut him he bled Bible. Bishop Ryles said. “It is still the first book which fits the child’s mind when he begins to learn religion, and the last to which the old man clings as he leaves the world.” That cannot be said of any other book. It has been given to us to make us wise for salvation and the more we truly know that book the least likely we are to being led astray. It is how we endure to the end. The other warning that Jesus gives is about how we are react in the midst of persecution. That may not be a significant threat to us in America right now, but the Church around the world knows how applicable are Jesus’ words. They are particularly meaningful to the Coptic Christians in Egypt who are being burned out of their churches or to the dozens of Christians killed this month in Syria by Islamist rebels or to Pastor Saeed who has recently been transferred to a particularly brutal prison in Iran, the kind of prison where people are never seen again. I read this week of 80 people being executed in North Korea for the offense of owning a Bible. These are not isolated incidents. The 20th century saw more Christians killed than all the previous centuries combined and if things keep going as they are this century could well be bloodier still. Further, we should not be deceived into thinking that persecution could never happen here. It is increasingly popular to mock Christianity where they would not dream of mocking any other religion. Awhile ago I was reading a post on my son’s face book where his friends were bemoaning the fact that a couple of amendments in their state did not pass. One of his friends said that they failed because of all those people who read the Bible and then he went on to say, “I hope they die, die, die.” Evidently tolerance and diversity don’t apply to Christians. But it goes deeper than just pop culture. One Christian commentator is drawing attention to an important change in rhetoric that we need to watch. People are using the expression “freedom of worship” now in place of “freedom of religion.” That sounds like a minor word change but the difference between the two is being played out in some places in Europe and Asia. People have freedom of worship so they are free to attend Church. But they do not have freedom of religion so they are not allowed to have home Bible Studies or to evangelize or to speak about their faith in public. Fr. Midgett told us last week of two evangelists in England who were arrested for street preaching. Why? Because taking a moral stand based on your faith can be said to fall fall under the rubric of “hate speech.” That kind of thinking is coming to America if it is not already here. So what are we to do in the midst of opposition? How do we ensure that we remain faithful? How do we endure to the end? Jesus points us in the right direction when He says, “Settle it therefore in your minds, not to meditate beforehand how to answer; for I will give you a mouth and wisdom, which not of your adversaries will be able to withstand or contradict.” In other words Jesus is telling us to trust Him. And why should we trust Him? Because He has got it under control! That is precisely the message in the Revelation to John to the persecuted Church. We are to be faithful to the end because God is in control; not the false prophet, not the beast, not the dragon…God. The Lamb upon the throne reigns supreme and since nothing can separate us from His love, we have nothing to fear. Today’s Gospel is not an easy one to hear but I can’t think of a more important message for us to receive. We must endure to the end and we will endure to the end if we will not be led astray by false prophets because we know the words of the true prophets. We will endure to the end if we trust that Jesus has it under control. Study the Bible and trust Jesus. Study the Bible and trust Jesus. That is how we endure in the last day. Come to think of it that is also great advice for getting through next Monday. But can it be that simple? Study the Bible and trust Jesus? Let’s give it a try and see. Amen. Morning Prayer for the Liturgically Challenged. Fr. Chris recently posted about saying Morning Prayer and I received a request from a parishioner to teach about how to read the Daily Office. Below is a short tract I wrote years ago that I hope you will find helpful. Bishop James Montgomery, in his introduction to the Daily Office Book, called Morning and Evening Prayer, “perhaps the greatest liturgical treasure of the Anglican Communion”. Among a plethora of devotional material, the Daily Office is unique in its use of ancient prayers, exposure to Holy Scripture, and collection of inspired worship in the use of the Psalms and Canticles. There is a balance and a rhythm of spirituality that begins in personal penitence and ends in the celebration of God’s goodness “to us and to all you have made.”. When done privately the Office can take as little as fifteen minutes or it can be expanded to however long you need it to be, as you include times of reflection, meditation and extemporaneous prayer. It is a privilege to pray these Offices that have been the prayers of saints past and will be the prayers of saints to come. The following is a primer on the use of Morning Prayer and the user is encouraged to add the variations of the Office as they grow with it and make it their own. While I prefer to use the Rite One option, this primer is teaches how to use Rite Two. The Lectionary for the Daily Office begins on page 936 in the Book Of Common Prayer (BCP). This lectionary is on a two year cycle. The lessons for year one are on the left page and the lessons for year two are on the right page. Each cycle begins on the first Sunday in Advent. Advent of even numbered years begins year one and Advent of odd numbered years begins year two. Find the current week of year one or two, which you can find by a liturgical calendar or it should say on your Sunday bulletin. For example; March 15th 1998 is the Third Sunday in Lent (Week of 3 Lent) so the lessons for that week are found on page 954 of the BCP. Next to the days of the week you will see some numbers divided by a small cross. These are the Psalms of the day and the cross separates the Psalms for Morning Prayer from those for Evening Prayer. Below the Psalms are the three lessons of the day. It is typical to read two lessons in Morning Prayer and one in Evening Prayer. Mark your lessons in the Bible and mark the Psalms in the BCP. Don’t panic! Finding and marking the lessons and canticles is the most difficult part. Your first words (unless you wish to make a confession on pg.79) are “Lord, open our lips.” from Ps 51:16. These were the first words spoken in monasteries to break the silence that began the previous evening. Even when praying the Office alone, pray both the lines of the officiant and of the people. (You are never alone when praying the Office. Somewhere among the 77 million Anglicans someone else is praying and even if they were not you are praying with “angels and archangels and all of the company of heaven.”) Next say the Doxology (“Glory to the Father…”). Skip, for now, the antiphons p.80, 81 and turn to p. 82. Choose either the Venite or the Jubilate. These are Psalms that invite us to worship. You will want to alternate between them each day. Next read the appointed Psalm that you previously marked. At the end of the Psalms say the Doxology again. This frames the opening part of the Office. The rhythm is to hear from God and to respond in praise. Read a Lesson and follow it with a Canticle. The Canticles are on pages 85-96 and the chart on page 144 gives the Canticle of the day after each lesson for Morning Prayer. The chart on page 145 are the Canticles for Evening Prayer. This may seem awkward at first but after doing it a few times you will appreciate the flow of this pattern. This recalls the essence of our faith and as the creed of our baptism it reminds us of our Baptismal Covenant. Begin with the Lord’s Prayer and choose either Suffrages A or B, again alternating between them each day. These versicles and responses are reflective of the Prayers of the People found in the Eucharist. The Collect of the Day can be skipped for now because it refers to the Collect from Sunday or from that day if it is a Holy Day or a Saint’s day from Lesser Feasts and Fasts. You may want to add it later as you learn the Office. It is appropriate to pray that Collect from last Sunday all through the week. You will find a set of seven Collects beginning with “A Collect for Sunday”. Since there are seven Collects you may wish to select one for each day of the week, for example, A Collect for the Renewal of Life on Monday, A Collect for Peace on Tuesday, etc. The three unnamed Collects, which begin on p.100, are the Prayers for Mission. Choose one and alternate them throughout the week. The third prayer for mission on p.101 is particularly appropriate for Fridays, the day of Christ’s crucifixion. Pray one or both. The General Thanksgiving is a magnificent prayer that is well worth memorizing. The Prayer of St. Chrysostom is an ancient prayer that sums up our particular prayers. Conclude with “Let us bless the Lord” and one of the three graces. It has been said that we pray our theology and we do. I came across a blessing for All Saints’ Day that is both a beautiful blessing as well as a concise explanation of “Why all this fuss about the saints.” It begins, “May Almighty God, to whose glory we celebrate this festival of all the Saints, be now and evermore your guide and companion on the way.” The saints are an occasion for celebration. Recently Fr. BE and Miss Beth went to Florida where their daughter was being inducted into a sports hall of fame for her accomplishments as a long distance runner. Now a married woman and mother of 5, she set records then that stand today. Fr. BE said that as they read off her accomplishments, he was amazed at all that she had done and he was one very proud papa. When you honor the kids, that honor also goes to the parents. So not just on All Saints’ and All Souls’ but on all of the Holy Days it is an occasion to honor God for what He has done in the lives of these men and women. Those Masses are like having a hall-of-fame meetings to honor the kids and when we do we honor our heavenly Father. By the way the attendance at holy days has been very sparse. I want to challenge you to look more closely at your priorities. In that day the Puritans and the Catholics were battling for the heart and mind of the Anglican Church and it appears that when it comes to this particular Article the Puritans won. Still other scholars argue that this Article is not a whole sale rejection of the idea of the saints in glory praying for us but rather a rejection of how it was being abused in the Roman Church in that day. One of the largest churches in the world is in Korea. I have not kept up with it but at one time the pastor was Pastor Cho. Pastor Cho was a dynamic preacher and one of the things that made him so affective is that while he is preaching the undercroft of the church is filled with parishioners praying for him. I have been told that some of them would pray and fast throughout the weekend. But while he is preaching they were interceding for him below. I told Beth about this and she has utilized that idea for a long time. When I am going to have a particularly difficult meeting or facing some difficult decision, she asks me for the exact time that I will be doing it and she prays for me during that time. She calls them Pastor Cho prayers. I think that is adorable of her but of course you and I both know that her prayers for me are entirely unnecessary. After all I am ordained. I have a direct relationship with God through Christ, so why would I want or need the prayers of a cute blond Social Worker? I hope that you are angry with me right now for my hubris and I would suggest to you that is exactly what we are displaying when we reject the intercession of the saints. It not only honors and blesses me that Beth would sacrifice the time to pray for me but I also know that God honors those prayers because I have seen them work again and again over the years. Like any truth this idea of the intercession of the saints can be abused so we need to clarify a few things. First we do not use the saints as mediators. By that I mean that we do not believe that we have to go through them to get to God. But that does not mean that we do not need their prayers. Let me use an analogy. Many times parishioners will call or text me and ask for my prayers. They know that in Christ they have direct access to God but it is a comfort to also have the prayers of their priest. Why? Because that is what we do as the Body of Christ. Those who call me do not pray to me, they simply ask for my prayers. That is how we relate to the saints in glory. We do not pray TO them we pray WITH them. Someone once asked me once if the saints in glory know what is going on down here. I reminded them that at the Transfiguration Moses and Elijah were discussing with Jesus his impending death. They knew about it before the disciples did. It is also important for us not to use the intercession of the saints like a rabbit’s foot or a charm. That is a misuse of the Body of Christ. In Italy Beth and I saw a huge relic of a saint that the Medici family kept in their bedroom. I asked the tour guide why they kept it in their bedroom and she said it was for good luck. A dead saint would do no more for good luck than having ME sleep in your bedroom, which would be as ineffective as it is creepy. One author said that the intercession if the saints can, “…. readily degenerate into the notion that getting what you want from God is a matter of knowing what channels to go through, what strings to pull. One ends up thinking of heaven as a place like the seat of a corrupt government where favors are traded and deals are made by influence peddlers.” But we don’t have to make it all that smarmy or that complicated. Here is how I think of it. My father was a godly man who every morning got up early to read the Scriptures and pray for his family. I do not believe that now he is in the nearer presence of God that he has stopped praying for us nor have I stopped praying for him. To do so would be to confess that death conquers love, which I do not confess. If you are engaged in an individual sport or competition how do you improve? First you practice, practice, practice. But if you really want to take it to the next level, then you find someone who is better than you and you practice with them. That is what the lives of the saints do for us. They don’t substitute for us in the practice of our faith, but they make us better at it. How? As just mentioned, through their prayers, but also through their examples. When I was being threatened with being defrocked by the Episcopal Bishop I though about St Athanasius who was essentially defrocked 5 times by heretic Bishops. The thought of him going through all of that made having it only happen once to me (so far) a piece of cake. When I am having a bad day I think of the saint who fell off her mule into the water and cried out “God if this is how you treat your friends no wonder you have so few of them.” Yes saints have bad days too! When I want to lash out in revenge I think of Steven who forgave those who were about to stone him. I’m sure you have your list. I hope that you do. Hebrews tells us that the saints are given to us to inspire and encourage us, so that surrounded by their love and witness we are able to run with endurance the race that is set before us. Thanksgiving will soon be here. It is a time to gather with our families and break bread together and to thank God for how He has so richly blessed us. Some in the family we are very close to, some we hardly know, and some we have to work at to love. We’ve all got the weird uncle or the obnoxiously loud aunt but we are family and it is the variety and even the strangeness that makes it all work. That is the way it is with the saints we remember today. Even the famous ones had their issues, but so do we. It is said that every saint has a past and every sinner has a future. It is by God’s grace that we are family and they gather with us to break this sacred bread and along with us to glorify God. This is what we confess each week in the Creed when we declare the we believe in the Communion of the Saints. We are the richer for it, thanks be to God.